I really should make stir-fry more often. It has three main elements that I often look for when cooking for myself. It’s fast; check. It’s healthy; check. It’s delicious; check. Lately, weekday dinners have consisted of reheating leftovers from the weekend, or meals I’ve stashed in the freezer ages ago and “rediscovered”, as I’m often too tired to slave away in the kitchen after coming home from work. But my best friend from home was visiting me earlier in the week, and there was no way I was going to feed her my pitiful leftovers. Plus she was getting a little eating-out overkill, so stir-fry it was. This stir-fry is reminiscent of those ones you might find in a Thai restaurant: meat and vegetables stir-fried in a savoury sauce and Thai basil. I absolutely love the licorice flavour that basil gives off—it’s so robust and delicate at the same time. The sauce is also delicious, the secret—in my opinion—lying in the rice vinegar, which gives it a nice acidic twist to cut through the saltiness of the sauce and to bring out the natural sweetness of the vegetables. 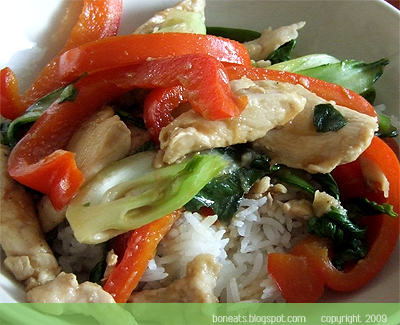 If you can’t find Thai basil, any other basil variety will work just as well! Pat chicken pieces dry with paper towels. 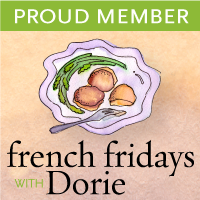 In a small bowl, toss chicken with cornstarch, cooking wine, and season with salt and pepper. In a large nonstick skillet or wok, heat 2 tablespoons oil over medium-high. Cook the chicken until browned, but not completely cooked through, about 2 to 3 minutes. Add onion, pepper and bok choy (if using green onions, add a little later with garlic instead); cook over medium-high heat; tossing often, about 3 to 4 minutes. Add garlic; cook until fragrant, about 1 minute. Add ¼ cup water, vinegar, soy sauce and oyster sauce to the pan; cook, tossing, until chicken is cooked through, about 1 to 2 minutes. Remove from heat and stir in basil leaves. 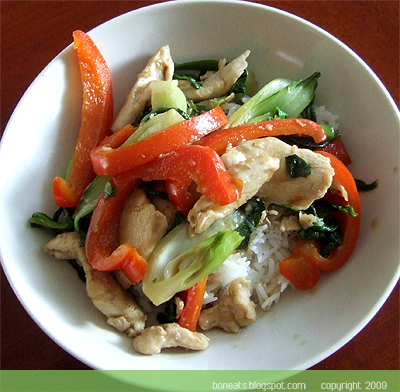 Serve immediately with steamed white or brown rice, if desired. I always keep some of my mom’s wontons on hand in the freezer. It makes for a quick solution to a meal when I come home and am too tired to cook, or makes for a yummy and healthy snack in the middle of the night. I get my mom to make me the northern-style wontons, since they’re the only kind I’ll eat. It’s filled with a mix of ground pork and shrimp and shredded napa cabbage, versus its Cantonese counterpart, which usually contain just large chunks of shrimp and maybe some bamboo shoots and shiitake mushrooms. It’s just a lot of shrimp for me, and I like the balance of the meat and shrimp in the northern-style wontons. Usually I just throw them in some boiling water and serve with some lo-mein (boiled egg noodles tossed with some oyster sauce, soy sauce and sesame oil), but I decided to make a dressing for them the other day. It’s based off a dipping sauce my mom actually makes for dumplings, but I figured it would go just as well with wontons. A great combination of flavours, from the sweetness of the sugar, the saltiness of the soy sauce, the sourness of the vinegar and the spicy kick of the ginger and chilli sauce. 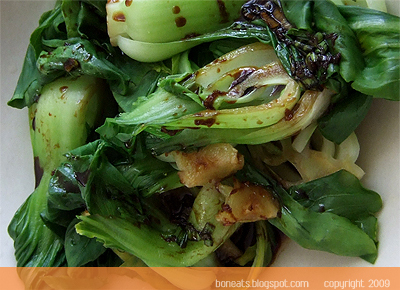 The leftover dressing tastes great drizzled over some steamed baby bok choy as well! 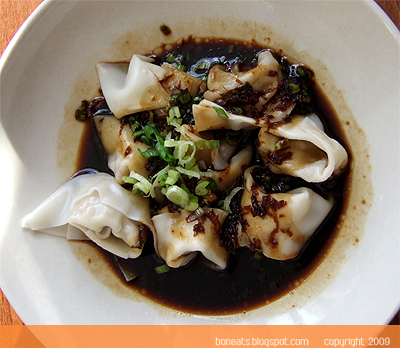 Mix everything in a bowl, and drizzle over wontons, dumplings or steamed greens. Or simply serve on the side as a dip. Baked some cupcakes last night for someone's birthday in the office today. Opted for a classic combo: chocolate cake base topped with a rich vanilla buttercream. Nothing beats the marriage of chocolate and vanilla. Also got a chance to finally open up my bottle of "confetti" sparkling sugar that I bought at Degrees before Christmas. 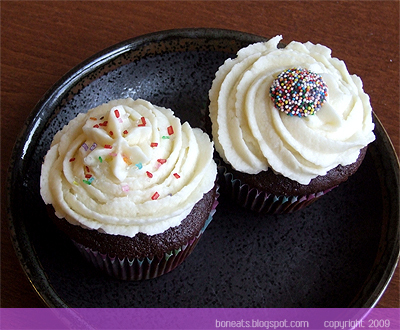 Aren't they beautiful, all those colours sparkling against the creamy white of the buttercream? Yes, yes...it was an impulse purchase, but I couldn't resist since they were so pretty sitting in their jar. Also used some leftover milk chocolate melts dipped in rainbow sprinkles that I found lying around to top the cupcakes. They look so festive, don't they? It may seem a bit counter-intuitive to make what is typically a delivery dish at home, but then again, I don’t live in South Korea, and so, jajangmyun isn’t delivered here. I’ve often seen jajangmyun featured in countless Korean dramas, and my mother, being curious about the dish herself, ended up bringing home a jar of chunjang (roasted black soybean paste) after a visit to Galleria. 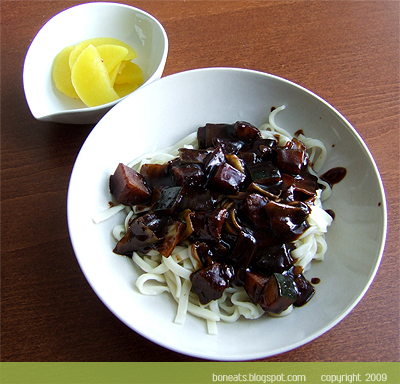 Jajangmyun is the Korean version of zhajiang mian (炸醬麵), a noodle dish that is popular in the northern part of China. Zhajiang mian is typically made with ground pork and fermented soybean paste, making for a “dry” sauce (think à la “bolognese”), and served with julienned cucumbers. The Korean variant has a much “saucier” sauce, with diced pork (some variations contain seafood instead) and vegetables (like zucchini, onions and carrots), and chunjang. The dish is popular in South Korean because it's cheap and many restaurants provide free delivery. Bowls of jajangmyun are covered with plastic wrap, carried off in portable tin boxes, and then carted across the city on scooters. 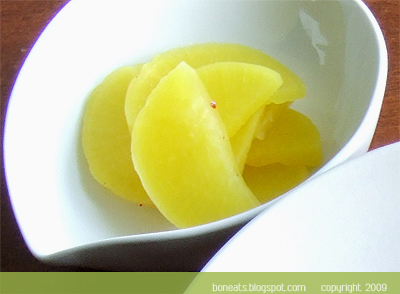 A side dish of danmuji, yellow pickled radishes, often accompany each bowl of jajangmyun, and is said to help with digestion. When done, the dishes are left aside to be picked up again and brought back to the restaurant. It’s an incredibly simple dish to put together, and you can always make extra sauce and store it in the freezer, perfect for those days when I’m too tired to cook. All I have to do is defrost the sauce in the refrigerator the night before (or if you forget, just stick in the microwave for a few minutes to defrost), boil some noodles, and settle down in front of the television to catch up on some Korean dramas! 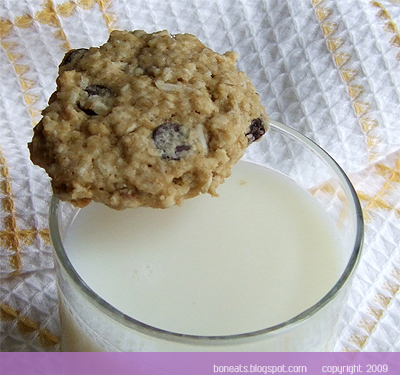 These cookies are a fabulous treat, and a great way to make use of those overripe bananas! 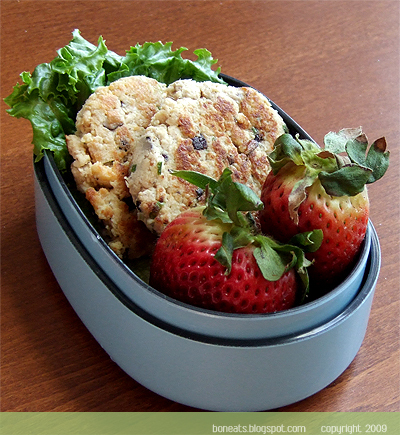 They're also a fun change to banana bread, muffins or pancakes (my usual staples when I have too-ripe-to-eat bananas lying around), are easy to pack for lunch or picnics, and will surely be enjoyed by all age groups. 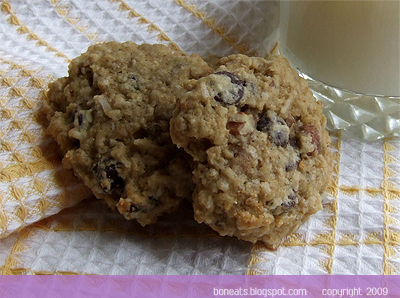 Like any drop cookie recipe, these ones are so easy to make, and quite forgiving with what you can add and take out. I've finally come to an adaptation of the recipe that I really like. I like to add a half cup of shredded coconut for some added texture (this cookie is all about flavour and texture), and replace the walnuts with pecans. I also like to pull out the "healthy" card when it comes to these cookies, but let's be honest, they're not really that healthy besides having oatmeal and some whole wheat flour in them (hey, at least you get two servings of fruit with the banana and coconut, right?!). You can make them a bit healthier though by replacing the chocolate chips with some dried fruit, like chopped dates or apricots. 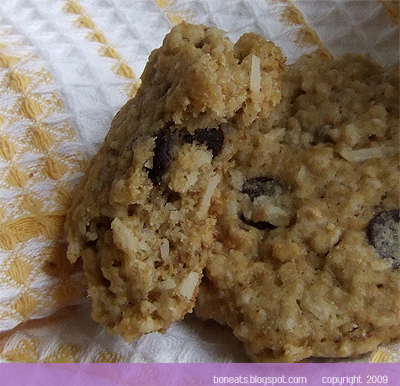 The banana keeps the cookies incredibly soft and tender, and the flavours really intensify the day after baking. I always love making a batch and throwing them in the freezer; they make for a quick treat on-the-go when you've got nothing else around the house. Just take two or three out of the freezer in the morning and pack them into your lunch, and they'll be defrosted by the time the afternoon rolls around for the perfect pick-me-up with your coffee or tea. Kids will also these with a glass of milk. And while I've justified calling these "energy" cookies because of how chock-full they are with goodies, you're probably just going to get a quick sugar-high. But then again, who really cares as long as they're tasty, right? Whisk together flours, rolled oats, shredded coconut, salt, and baking soda in a small bowl; set aside. Put butter and sugars into the bowl of an electric mixer fitted with the paddle attachment; mix on medium speed until pale and fluffy. Reduce speed to low. Add egg and vanilla; mix until combined. Mix in banana. Add flour mixture; mix until just combined. Stir in chocolate chips and pecans. Drop dough, shaped into 1 1/2 inch balls, onto baking sheets lined with parchment paper, spacing about 2 inches apart. Bake cookies, rotating sheets halfway through, until golden brown and just set, 12 to 13 minutes. Let cool on sheets on wire racks 5 minutes. Transfer cookies to wire racks; let cool completely. Cookies can be stored in airtight containers up to 2 days, or can be frozen in an airtight plastic bag for up to 1 month. I was clearing out my fridge yesterday and found that there were little bits and pieces of ingredients sitting around and taking up room. The problem was, there wasn’t enough of each to make a full on meal on its own. What better way to use up these odds and ends than throwing them together to create something new? 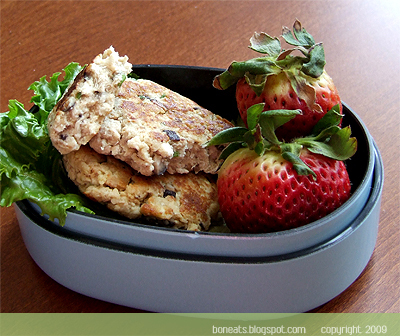 I came across a recipe for Tuna Tofu Miso Burgers at Just Bento, and it had me intrigued. I definitely had the basic ingredients, since there always seems to be tofu in the fridge, and cans of tuna sitting in my pantry. I made a few changes, like replacing the breadcrumbs with cracker crumbs, as I was far too lazy to make my own breadcrumbs. I also had a few shiitake mushrooms leftover, so I added those into the mix. If you want a smoother texture to your patties, throw everything into a food processor and let that do its magic, although they turn out perfectly fine (and with a bit more texture) if you mix by hand. Plus it'll be one less thing to wash! These mini-burgers are super easy to make, freeze well, and are the perfect size to pack into your lunchbox, along with some fresh veggies and fruit. Drain the tuna and the tofu very well. To drain the tofu, wrap with paper towel and place the block on a flat surface (like a cutting board). Place another flat object on top of the tofu, and then place a heavy object (like a heavy pan) or a couple of cans on the flat surface. Let stand for 15 minutes to allow water to drain from the tofu block. Heat a little oil in a nonstick frying pan over medium heat. 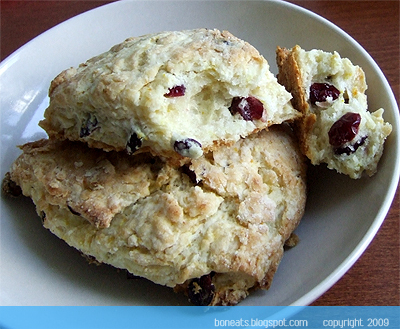 Scoop out heaping tablespoons of the mixture and form into mini patties. Pan fry the patties on each side for a couple of minutes until golden brown.